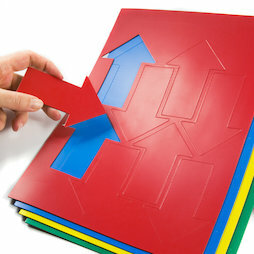 Large magnetic arrow symbols made of colourful magnetic sheets serve as eye-catchers or to highlight content on whiteboards, planning boards and other magnetic surfaces. Also perfectly suitable for planning and project management since they can be moved around and repeatedly labelled with water-based markers. Available in the colours blue, red, green and yellow. 1 pc. 5.95 CHF ea. 1 pc. 3.35 CHF ea. 1 pc. 4.95 CHF ea. 1 pc. 34.90 CHF ea. 1 pc. 116.75 CHF ea. 1 pc. 127.90 CHF ea. 1 pc. 29.90 CHF ea. The magnetic symbols are writeable with whiteboard marker that can be cleaned off without residue which allows for temporary labelling. The coloured symbols can also be used as eye-catching writeable magnetic signs on metal shelves, etc.